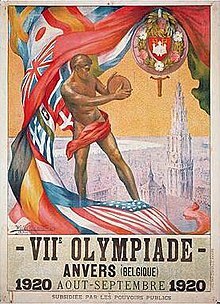 The 1920 Summer Olympics, officially known as the Games of the VII Olympiad, were held at Antwerp in Belgium. The games were a financial strain for the host country and the participants. The events were not well attended. A total of 22 nations sent athletes to compete at the Antwerp games. ↑ Sports Reference.com (SR/Olympics), "1920 Antwerpen Summer Games"; retrieved 2012-7-23. ↑ Zarnowski, C. Frank. "A Look at Olympic Costs," Citius, Altius, Fortius (US). Summer 1992, Vol. 1, Issue 1, p. 20-21 [5-6 of 17 PDF]; retrieved 2012-7-24. ↑ Taking part in the games for the first time were Czechoslovakia, Brazil, Estonia, Finland, Monaco, New Zealand and Yugoslavia.